Happy Monday! Sorry, too soon? 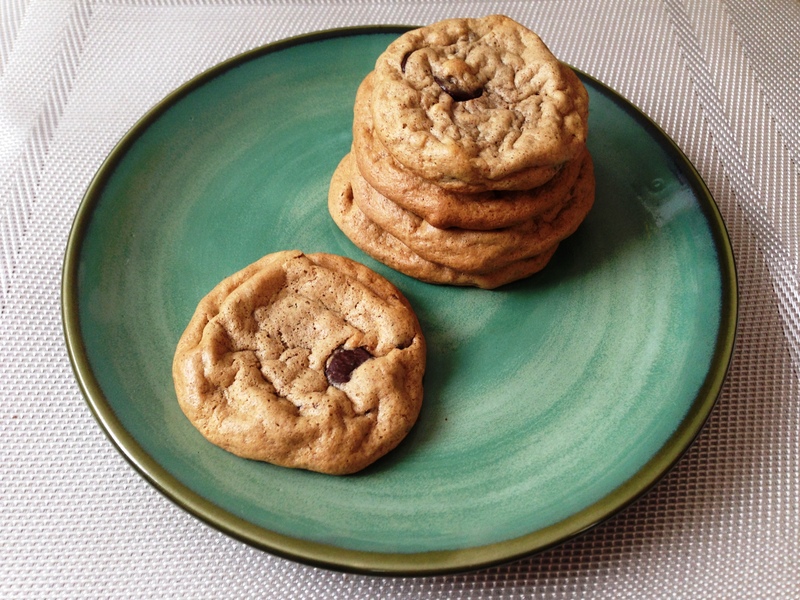 I know it’s THAT DAY of the week, and we’re all coming off our weekend high, but I’ve been dying to share this recipe for chocolate chip cookies with you guys! You see, I’m a strong believer that everyone should have a few go-to, classic recipes under their belt, that they can whip up quickly when the occasion calls for it. Chocolate chip cookies definitely fall in that category, and I was incredibly disappointed in myself when I discovered last weekend that I did not have my own chocolate chip cookie recipe. What the heck, Stephanie? So I got to work, using almond butter as a base (because, duh. Almond Butter = Love). 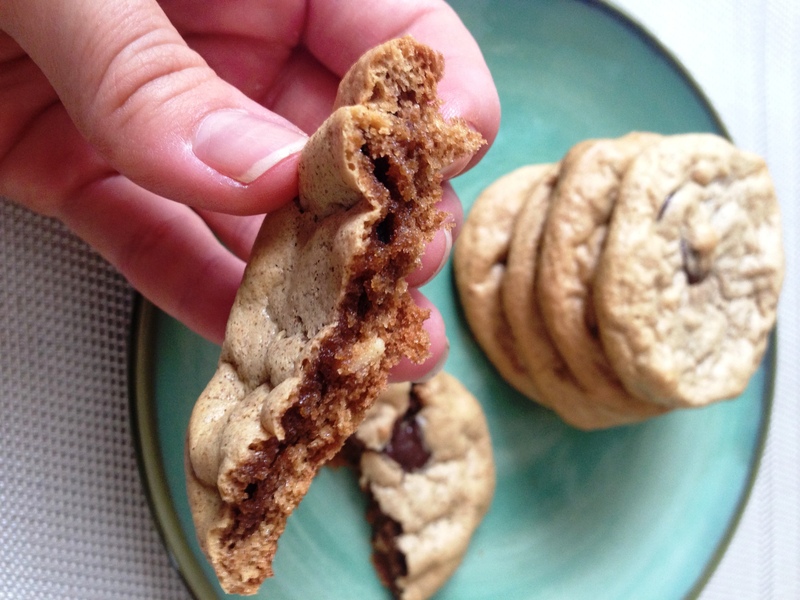 My first version came out too dry and crispy – I wanted more of a soft, chewy and gooey type of cookie. A few more tweaks later, we were back in business! However, I had to laugh when I looked at the final ingredients list. I basically made my brownies into cookie form, minus the cocoa powder. Ha! Oh well, now you have a brownie and a cookie recipe that you can use fairly interchangeably. Less ingredients to remember, right? Two birds, one stone. I swear, I’m only thinking of you guys. 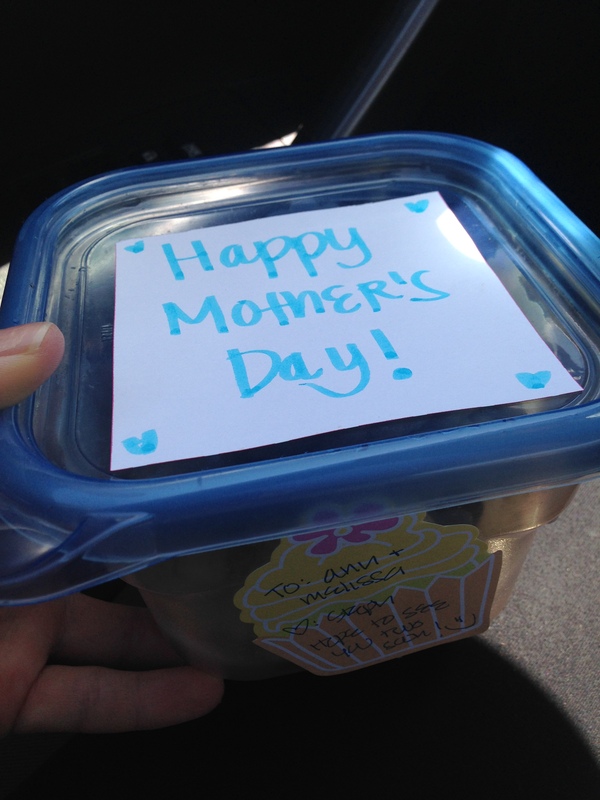 I sent off a batch with Matt when he drove down south to surprise his mom for Mother’s Day, and they were mother approved. Success. What else is happening in the cave? In the Crossfit world, I’m super excited about the new Crossfit Invictus programming at my local box, CrossFit 580. We’re really focusing on form and technique right now, and I’m already seeing a ton of improvements on my Oly lifts. I love that moment when something just clicks in your head, and you’re finally able to execute something that you’ve really been struggling with. CrossFit Regional events started last weekend! Have you started watching them yet? You can catch up here. I may have skipped my actual crossfit workout, and watched these instead, but that’s neither here nor there. Matt and I went for a 4 mile run through Livermore in place of hitting the box, and it felt wonderful to get out there and hit the pavement for a change. In other news, I found a few things on the ‘net that I wanted to share. First, StandUpKids is on a mission to provide standing workstations to all public schools in 10 years. Now that’s a mission I can support. Read more about their mission here, and how you can help here. Hey Corporate America, when are you going to catch on?? I made a slightly modifiied version of this honey mustard chicken and potato dish from Kim and Amanda at PaleoSchmaleo. Instead of cooking the potatoes and chicken together, I baked the chicken in my own homemade honey mustard (honey + dijon mustard + olive oil, to taste), and made mashed sweet potatoes on the side. It was SO GOOD. This will be rotated in the weekly menu planning on a regular basis from now on. I finally caved (hehe) and bought a veggie spiralizer from Bed Bath & Beyond. Shh, I know I’m like, 3 years too late on this, but I can’t wait to zoodle the crap out of some zucchini tonight. It’s about to go down. I’ve been on a reading kick, and Matt suggested this book he’s listening to on Audible, about the power of habits in our lives. I can’t wait to dig into this. Okay Stephanie, get to the cookies already. 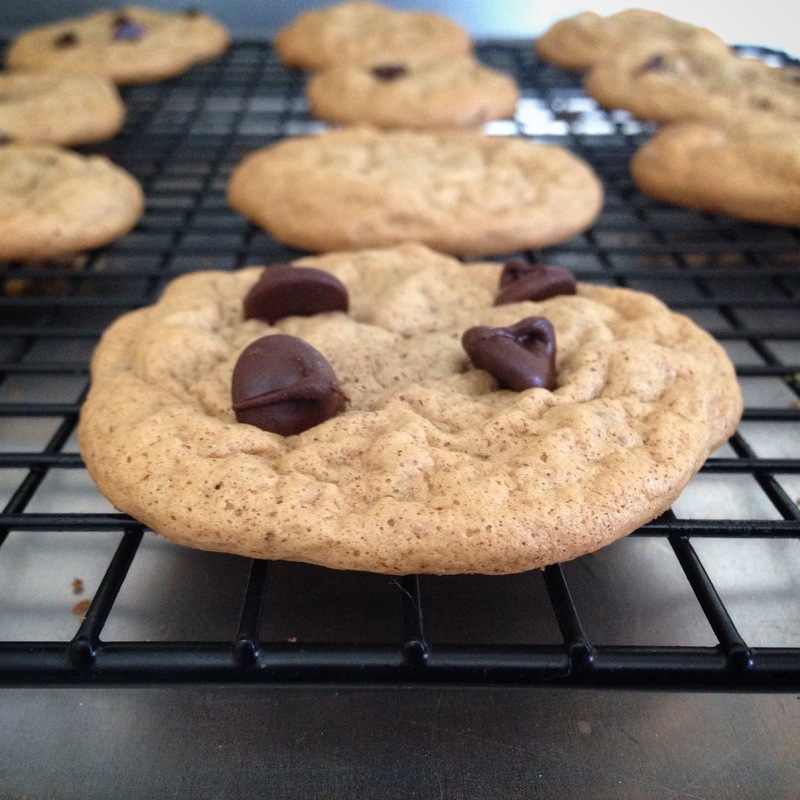 Paleo friendly, grain/gluten free, dairy free, refined sugar free. (1) tsp. baking soda, aluminum free (TraderJoe’s has one! Any type of electric, hand or stand mixer / or a good ‘ol fashion mixing bowl & spoon. Preheat your oven to 350°(F) / 177°(C). Start by putting the almond butter in the mixing bowl, and give it a few whirls. Add the eggs and coconut sugar and mix on medium speed until you’ve reached a batter like consistency. Add the baking soda and the sea salt and continue to mix for another 15 seconds. Scrape the bowl and mix on low for another 20 seconds. Once you’re satisfied with the cookie batter, fold in the chocolate chips and set in the refrigerator for about 10-15 minutes to set the batter, making it easier to handle. If you don’t have time for that, no biggie, your batter will just a little more runny and harder to form. When the batter is ready, use the large spoon to scoop out about 1 tablespoon of batter. You can eyeball it. Use your hands to roll out little balls of batter and place them on the parchment covered baking sheet, about an inch apart. Bake at 350°(F) / 177°(C) for about 10-12 minutes, and then let cool for about 15 minutes. The cookies will rise a lot in the oven, but will fall into place as they’re cooling. I pressed in some extra chocolate chips on top of the cookies when they were fresh out of the oven, and really liked the appearance of the addition. 3 batches were made, some were given away as gifts, and the rest were up to the mercy of myself, Matt, and the roommates. Needless to say, these did NOT last long in the house. Sorry, I just ruined your “crap, it’s almost summer and I need to look good in a bikini” diet. You sure can! Coconut sugar, brown sugar and regular cane sugar can be used interchangeably at a 1:1 ratio. Hey Stephanie, you are absolutely right! All kinda sugar are good to be used. Change is good. Glad you liked the chicken bake! Those cookies look amazing!